Despite scorching temperatures outside, the end of Summer is upon us. Not much time to enjoy the Fourth Turning of baseball’s regular season. It is the end of free play. The end of spontaneous trips for snow cones in the middle of the day. Back to school with heavy book bags and freshly polished linoleum. No. New obligations crowd our minds. Why is it that we do not typically delight in endings? Because it marks the completion of what we enjoy. We want to rewind the clock to experience it again. Desert might just be the iconic opposite to such a feeling. It is here that we pleasure in the final moments. The coda of a meal. It might even serve as the payoff for suffering through foods we don’t like. A reward for duties fulfilled. Eat your veggies to savor your sweets. As the story goes, Christopher Columbus brought back large fruit Europeans could not help but call Pina (pine cone). 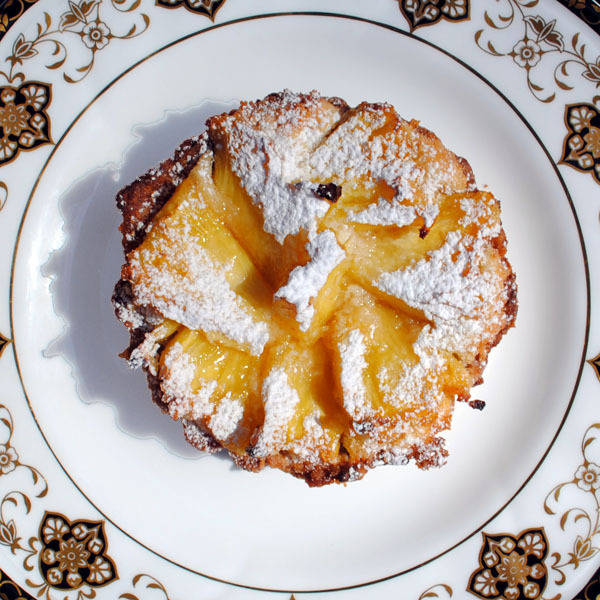 With densely sweet flesh and rough exterior, the pineapple emerged as a symbol of preeminence. And a stately way to great guests. A welcome to their home. It remains an icon for decoration even today. A perfect ingredient for desert as well. Pictured above, caramelized pineapple chunks sit in a nest of macadamia puree. Sweet with a little bit of chew. It conveys both the exotic and the familiar. Though it is not the only trigger for memory. Recent research adds more evidence to the potent nature of rosemary. We already associate the pungent fragrance with the homey nature of the Mediterranean. Of lazy afternoons that wind down in Tuscan hills. Today we learn that it is a foundation for bolstering prospective memory. That memory which we are about to have. The studies from Northumbria University showed subjects who remembered more when enveloped in that specific, herbaceous smell. The secret is an organic chemical called 1,8-cineole which helps with cognitive function around memory. It’s found in eucalyptus, bay, wormwood and sage as well. No doubt that you will notice these essential oils when shopping for candles next time. Or maybe a tea you ought to brew. It should come as no surprise that the Junior League titled their ground breaking recipe book Stop and Smell the Rosemary. Beyond the pun, this collection of recipes excites the mind as much as it excites the palate because it modernizes traditional dishes and introduces us to novelties. The ladies know precisely what they are doing consciously and subconsciously. Add this book to your collection if you haven’t already. 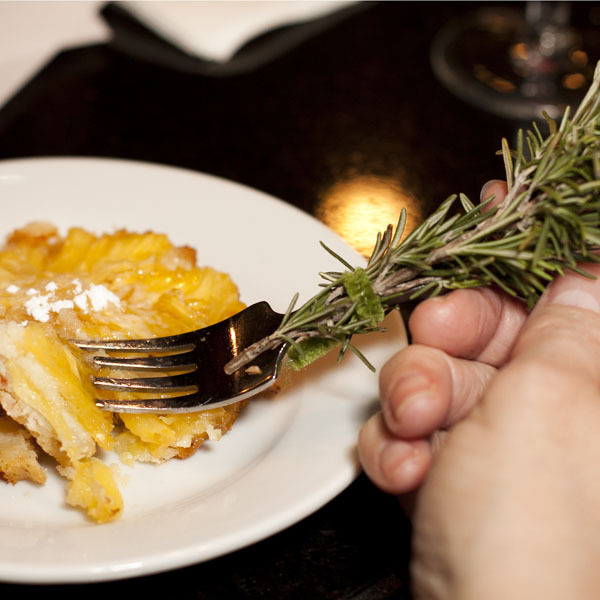 We tie rosemary sprigs to the desert forks for that pineapple tartlet. Call it particle stacking: a means of compounding an experience with two or more like elements. As the diner lifts the bite to the mouth, they inhale the fragrance of the herb. The combination of flavors of pineapple and rosemary assembles in the brain and not in the baking dish. And no where is memory more important than with thoughts of home. If your goal is to create a return to the comfort and blessings of family, then rosemary. Rosemary the chicken. Rosemary the cheese appetizer. And for the love of Mom and all things blessed, rosemary the desert. It worked for Italians. It will work for you. …wondering why home plate wasn’t called fourth base. Then it came to me: why not? Meditate on the name “home” for a minute. Home is an English word virtually impossible to translate to other tongues. No translations catches the associations, the mixtures of memory and longing. The sense of security and autonomy and accessibility. The aroma of inclusiveness and freedom from wariness. They cling to the word home absent from the word “house” or “my house.” Home is a concept, not a place. A state of mind where self-definition starts. It is origins. The mix of time and place and smell where one first realizes an original. And perhaps like others, especially those one loves. But discrete. Distinct. Not to be copied. Home is where one first learn to be separate. And it remains in the mind as the place where reunion, were if it to occur, would happen. All literary romance. All romance epic derives from the Odyssey. It is about going home. It is about rejoining. Rejoining of beloved; rejoining parent and child; a rejoining of land to it’s rightful owner or rule. Romance is about putting things aright after some tragedy has put them asunder. It is about the restoration of the right relations among things. And going home is where that restoration occurs. Because that is where it matters most.